The Finnish Olympic dream came to fruition with the Helsinki Summer Games of 1952. For two weeks, Helsinki offered the Olympics a neutral safe haven from the storms of the Cold War. At the same time, Finland was rewarded for the “lost” 1940 Olympics that never materialised, as the world plunged instead into a second great war. With the Helsinki Summer Games, Finland had a shot at achieving something quite unique – organising the world’s largest sporting event. For a country the size of Finland, the Olympics were definitely a very big project indeed. The country’s population had only recently topped four million; Helsinki had just 370,000 inhabitants. As the games approached, Finland experienced a kind of homespun “Olympic Truce”. The domestic political conflicts and gnawing disputes among sports organisations were put to one side, as nobody wanted to jeopardise the hosting of the games, which enjoyed broad popular support. The job of preparation for 1952 was eased by the existence of the Olympic Stadium, completed in 1938 for the cancelled 1940 Games. With additional temporary grandstands, this could be used as the main arena. The biggest construction project was a new Olympic Village. The enormous common effort of a small nation paid off. Helsinki witnessed what were the largest games to date, with the highest standard of competition. A record 4,407 men and 518 women went in search of medals, representing 69 countries. Seven track and field world records were broken. The Finns glowed with reflected pride at the numbers taking part and the great sporting achievements. The daily Helsingin Sanomat trumpeted that some of the records were “so astounding, so close to the physical limits of the human frame, that they will surely stand for years to come”. The biggest star was the Czech runner Emil Zatopek, who triumphed in the 5,000 metres, the 10,000 metres, and the marathon. His long-distance triple at one Olympics has never been matched. Helsinki showed the Olympics were turning into a global spectacle. Several countries made their Olympic debut here: the first athletes arrived from the Bahamas, the People’s Republic of China, Gold Coast (nowadays Ghana), Guatemala, Hong Kong, Indonesia, Israel, the Netherlands Antilles, Nigeria, the Soviet Union, Thailand, and Vietnam. Germany and Japan were reinstated, after having been barred from the 1948 Olympics. For Finland, it was particularly important that the Soviet Union made its entry into the Olympic arena. 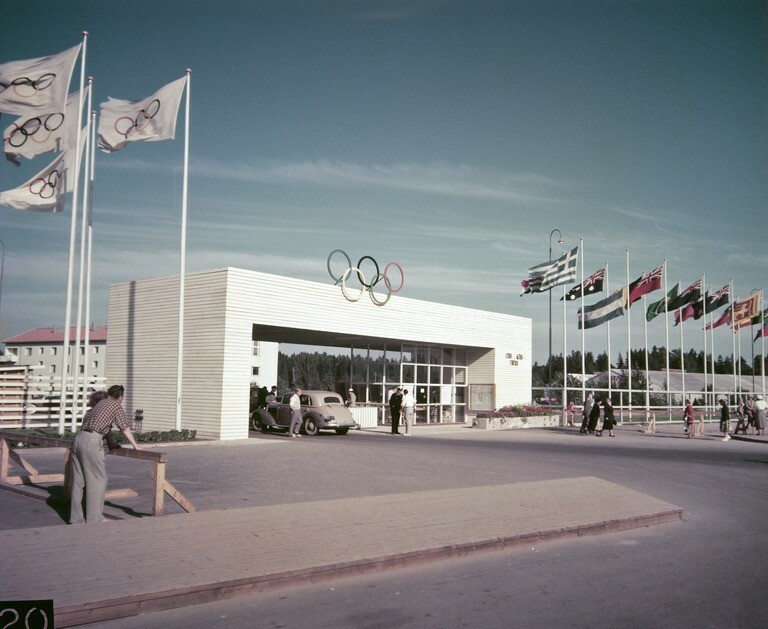 The Organising Committee under Erik von Frenckell guaranteed the participation of the Soviets by arranging a separate Olympic Village (on the University of Technology campus in Otaniemi) for teams from the Socialist bloc. The International Olympic Committee (IOC) signed up to this unique arrangement – it badly wanted the USSR to join the Olympic family. The athletes from the U.S. and the USSR smiled cheerily in their joint photo opportunities, but on the track and elsewhere, the competition was fierce. After a tight battle, the Americans topped the table, both in medals won and in the number of gold medals. At the Helsinki Games, sporting prowess emerged as one of the most important tools in the ideological struggle of the Cold War era. Outside the Olympic arenas, the Soviet Union and the U.S. played out their own hearts & minds propaganda contest, with culture and the way of life dominating the field of play. Victory went to the movies and music of the Americans, although there was no shortage of spectators for Soviet films and dance performances. The triumph of the Western camp was certainly not hindered by the return to Finland of Coca-Cola. The company donated 720,000 bottles of its flagship product to the organisers. Most were sold to the public by a charity assisting disabled war veterans. The most dramatic incident at the games occurred during the Opening Ceremony. A German woman named Barbara Rotbraut-Pleyer attempted to read an impromptu declaration of peace from the rostrum. Dressed all in white, and dubbed “the Peace Angel” by the press, she was led away by Erik von Frenckell before she could address the crowd. Finland basked in the favourable publicity surrounding the games. Aside from reporting on individual events, the nearly 1,200 correspondents and 164 radio journalists reported to the world the efforts of the feisty little sporting nation to make the games a success. The Suomi-image presented was a positive one: reporters wrote flatteringly of the Finns’ organisational skills, their reliability, and their general efficiency. There were critical voices: some saw the bloating disease of the Olympics getting worse; it was just “too big”. The sharpest barbs were directed against the steep cost of tickets and accommodation. Finland’s high cost of living meant that fewer Olympic tourists came than had been hoped. This was still well before the opening up of mass tourism, and the advance marketing of the games abroad was rather limited. The notion was that the Olympics would sell themselves: this proved to be wishful thinking. The Finnish team won 22 medals and finished eighth in the overall table. Medals were taken by Finns in nine of the 18 sports at the games. Relative to head of population, Finland achieved most podium places: one for every 190,000 inhabitants. There was one setback: for a country used to winning medals galore in track and field events, collecting just one bronze medal – in the men’s javelin – was a nasty blow to national pride.